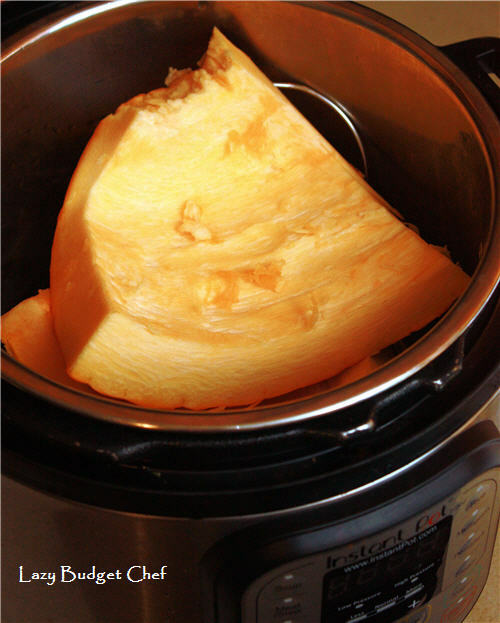 Lazy Budget Chef: How to Cook a Pumpkin in an Instant Pot in Fifteen Minutes or Less! How to Cook a Pumpkin in an Instant Pot in Fifteen Minutes or Less! I am a super fan of cooking with pumpkin because it is so versatile! You can eat it starting in the morning for healthy breakfast right on through the day and onto dessert. Which is why I try to buy a pumpkin every year. Pureeing your Halloween pumpkins and freezing or dehydrating them for later is a budget friendly way to enjoy this healthy squash after they disappear from the grocery store on October 31st. Unfortunately, since pumpkins take an hour to bake in the oven before I can even think about cooking with it or drying it into dog treats with the dehydrator that I can’t live without (learn more about it here) I don’t have the time to puree any more than one pumpkin a year – until now. 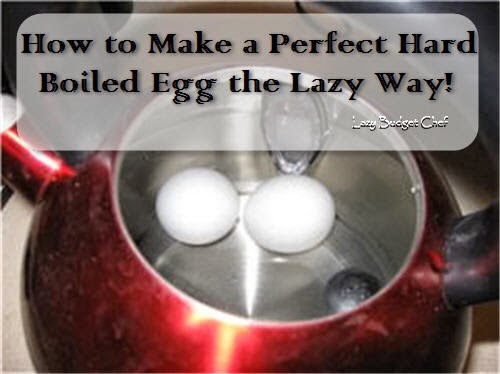 Pin this recipe tutorial for reference and to share with your friends! 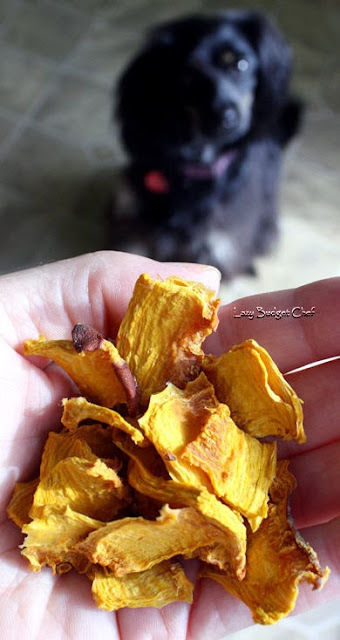 In this tutorial recipe, I am cooking a plain pumpkin that I will later use for soup and dehydrate into dog treats for Lacey. You can add extra ingredients to cook your favorite fall pumpkin recipe if you like or just scoop the cooked pumpkin out of the shell, and mix it with orange juice to make whipped pumpkin to serve as a side dish instead of whipped mashed potatoes. Nom! Nom! Another reason I dehydrate fresh pumpkin is I can easily rehydrate it for the household humans and to toss a handful into Lacey’s dog treat jar (similar to this one because I am a dork) for emergency fur kid bribes. Not to mention a dried medium size pumpkin it fits into less than two quart mason jars in the my small condo kitchen. Lacey's vet gave me a gold star for making her healthy dog treats. Lacey loves them and it helps me use leftover pumpkin. A win-win! 1. Cut the pumpkin open and remove the seeds and strings with a large spoon or by any means necessary. 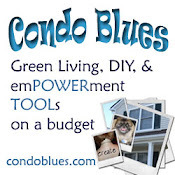 Tip: If you like to garden, compost bins loooooooooove pumpkin guts! 2. Put a vegetable steamer basket like this one in the bottom of the Instant Pot and add 1 1/2 cups of water. 3. Add the pumpkin to the Instant Pot and secure the lid closed. 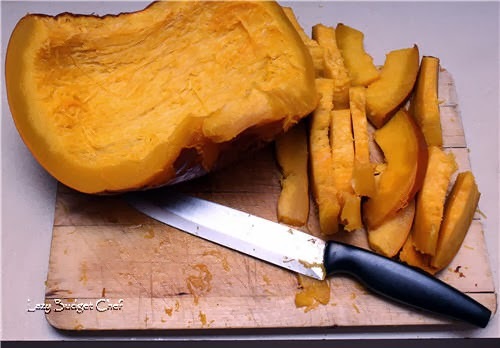 Depending on the size of your pumpkin, you might be able to put it in the pot uncut if, for example, you are working with a pie sized pumpkin. I had to slice my medium pumpkin into chucks to make it fit in my Duo. 4. Set the Instant Pot to cook on Manual High Pressure for 8 to 15 minutes depending upon the size of your pumpkin and who well done you want it to be. 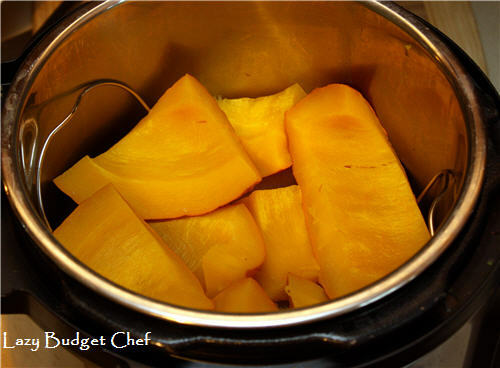 If you like your squash cooked a litter firmer, try setting the pressure cooker to eight minutes instead of fifteen. 5. Once the timer sounds, vent the steam from the Instant Pot, remove the lid, and behold Fifteen Minute Pumpkin Puree! 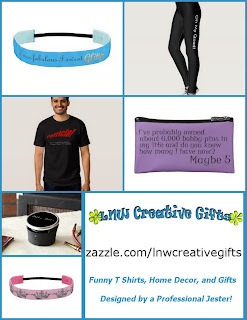 If you are an Instant Pot fantastic, check out some of the super helpful accessories below!